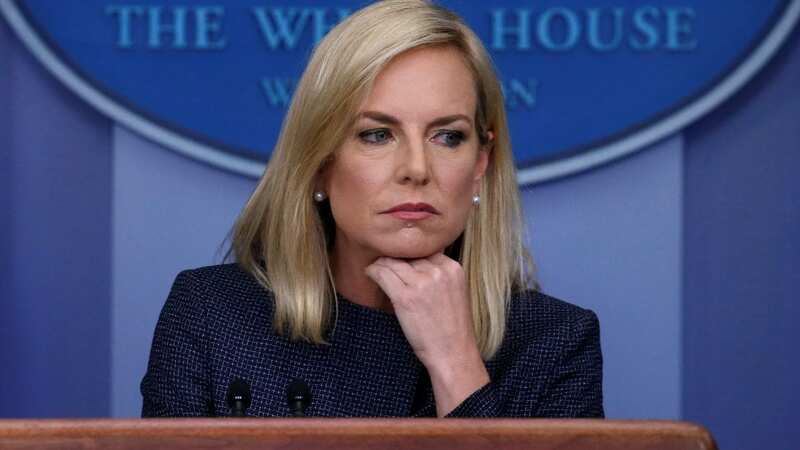 Embattled Homeland Security Secretary Kirstjen Nielsen ate dinner at a Mexican restaurant in Washington on Tuesday – and she was targeted by protesters who are angry over the Trump administration’s separation of children from their families along the U.S. border with Mexico. “We’re in downtown DC disrupting DHS Secretary Kirstjen Nielsen’s dinner at MXDC,” the Metro D.C. Democratic Socialists of America wrote. “The irony isn’t lost on us that this is a Mexican restaurant.”The protesters yelled “Abolish ICE!” before launching into a chant of “Shame!” as Nielsen sat with an unidentified man (reportedly her chief of staff, Chad Wolf, who previously accompanied her to the White House state dinner for visiting French President Emmanuel Macron). As the protest group neared the DHS leader’s table, they shouted “Mic check!” The man seated with Nielsen folded up a tablet. For much of the protest, he and Nielsen stared down at their laps – presumably at their phones. “If kids don’t eat in peace, you don’t eat in peace,” the protesters shouted. At one point, they played an audio recording of children crying inside detention centers after being split from their parents. Nielsen has been the face of the Trump administration’s zero-tolerance policy, defending her agency’s treatment of migrant families who enter the U.S. illegally — a policy that caused a firestorm of outrage after DHS said it had separated some 2,000 children from adults over the course of six weeks. As the controversy raged, President Trump said on Tuesday that immigrants could “pour into and infest” the U.S., blaming the Democrats — who don’t currently control either house of Congress.